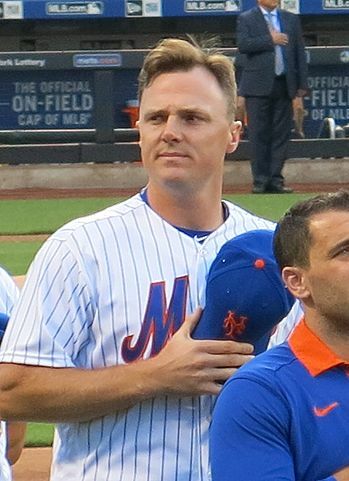 Jay Bruce in August 2016. Photo: Editosaurus via Wikimedia Commons. Before yesterday’s game, I speculated that Jay Bruce might be a good bet to sit against a left-handed starter, even suggesting Ty Kelly would make a good stopgap corner fielder due to Kelly’s strong numbers against lefties. Nevertheless, Bruce started the game and Kelly saw no action – by the time a pinch hitter was needed, right-hander Chaz Roe was in and lefty Michael Conforto was the clear choice off the bench. Last year, Terry Collins wasn’t happy with Bruce, famously allowing Eric Campbell to pinch hit for him in the September stretch run. It’s clear that Bruce has regained Collins’ favor, since he started against a left-hander last night and has performed well. However, he didn’t perform especially well against Jaime Garcia, as his fifth-inning walk was his only time on base last night. While it’s a bit early to rest a starting outfielder, Ty Kelly has fantastic numbers against left-handed pitching and I’d like to see him get more chances to demonstrate whether he’s been lucky or really has a read on the pitching. Playing Kelly would have still left righty infielder T.J. Rivera and righty backup catcher Rene Rivera – no relation – ready to come up in a pinch. Bruce’s defense has been decent; he logged two putouts and no errors last night. Still, Collins is showing confidence in Bruce, who many speculated wouldn’t even be a Met on opening day. Jay Bruce’s yearly walk and OBP numbers before this season. Bruce has seen a recent uptick in his on-base percentage, famously a crucial measure of contribution to the team. Currently, he’s sitting on an OBP of .538, driven in large part by 4 walks in 13 plate appearances. At .31 walks per plate appearance, he’s nearly triple his highest previous career season (.11) and over tripled his career mark (.09). He’s unlikely to sustain this; however, his OBP has climbed the past two seasons from a historical low of .281 in 2014 to a so-so .309 in 2016. It’s possible that Bruce is showing an early hot streak that is, nonetheless, a sign of growth at the plate. If Bruce were following a normal trend, we’d expect him to be at about .0838 walks per plate appearance. As noted, he’s at .31. In any 100 streaks of 13 plate appearances, he should be somewhere between .00 and .25 95 times. Although this is a very small sample size, it’s likely that Bruce has made some changes in his approach at the plate, especially since those walks haven’t been intentional. 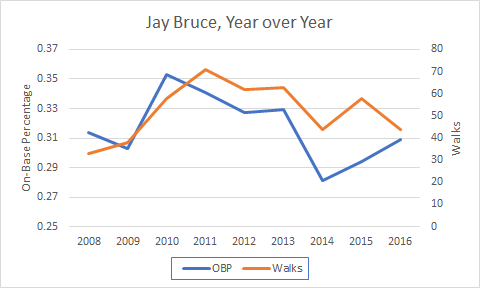 I’ve included a line chart of Bruce’s season walks and OBP over his time in the majors.